Carly Fiorina stepped onto the Tonight Show set Monday, and with the exception of an endearing karaoke session about her dogs, it was all business (a surprising choice given the setting of a late-night show). Fiorina showed some foreign policy chops while discussing how she would handle Russian President Vladimir Putin. But should she become POTUS, the truth is it won't be the first time Fiorina and Putin have met. During her sit-down, Fiorina said she briefly encountered the stone-faced Russian leader for 45 minutes in Beijing while both were waiting to present at an economic conference. According to The Daily Beast, that chance meeting was at the 2001 Asia-Pacific Economic Cooperation conference, where Fiorina took the stage just before Putin was set to address the summit's participants. It was a position she found fateful, given her speech was titled "A World of Change" and made note of it early on. One of the things they teach in business school is that positioning is crucial. How you position yourself in relation to your competitors can mean the difference between success and failure. Applying this principle to today's program, I keep wondering how it is that I got positioned to speak in the slot before the President of the Russian Federation — on the subject of change, no less. Hewlett-Packard has been at the center of a lot of change in our 62-year history. But President Putin was elected president in the first democratic transition in Russia in 1,000 years. Talk about giving new meaning to the word "invent." Fourteen years and a presidential campaign later, it seems Fiorina's opinions of Putin have dramatically shifted. 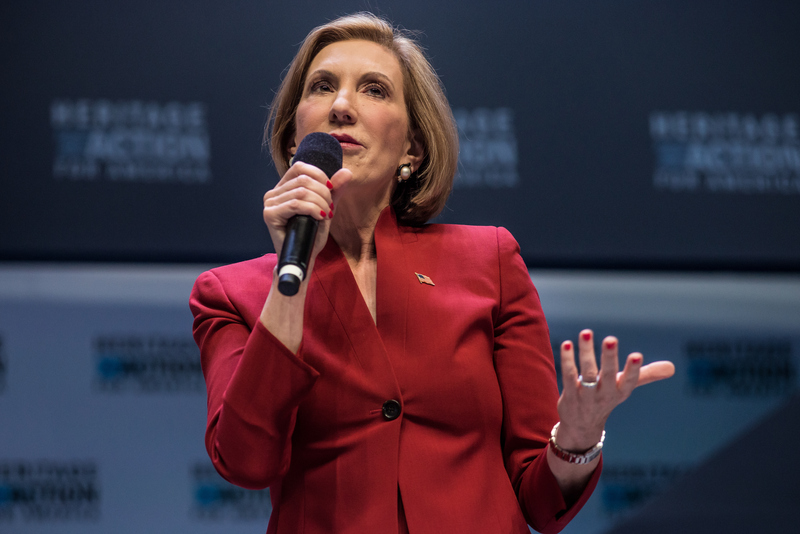 No longer a man of change, Putin has become a target in Fiorina's rhetoric. While chatting with Fallon, the Republican joked that the Russian leader was a "barrel-chested" kind of guy and even compared him with front-runner Donald Trump. I would describe him as a formidable adversary. He's very confident. He actually can be quite funny and charming, but he's a KGB guy. You know, we should never forget this. He lusts for power and he's gathered up a lot of it. And he's a very bad actor and it's a very bad thing that his fighter jets and his soldiers are sitting in Syria right now. Fiorina has maintained that if she is elected, she will not engage Putin in talks but instead act by rebuilding the Sixth Fleet and the missile defense program, arm Ukraine, and hold military exercises in the Baltic region. Given that Fiorina is a political outsider, it's important she asserts her knowledge on issues traditionally reserved for policymakers on Capitol Hill. The Tonight Show might have been an odd choice of venue to air out her foreign expertise — the appearance definitely took a different route than Hillary Clinton's stop last Wednesday — but it's like Fiorina has said. People still don't really know who she is, and every time she's in front of a national audience, she has to take advantage of the opportunity. Writer Tiffany Thomas contributed to this article.